My Greek adventures started late in the day with an evening flight from Budapest to Heraklion with Wizz Air. It was my first time flying with Wizz Air and it really was no different to flying with Ryanair or Easy Jet. We flew into Heraklion on the island of Crete. From there we rented a car and drove to a small village called Panormo where we would be staying for the next few days. 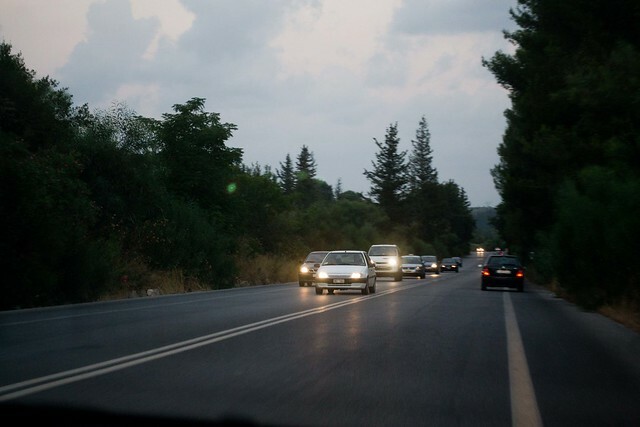 Driving in a foreign country in the dark is not easy, but if that country is Greece and you had just arrived, it is even worst, as we quickly discovered. 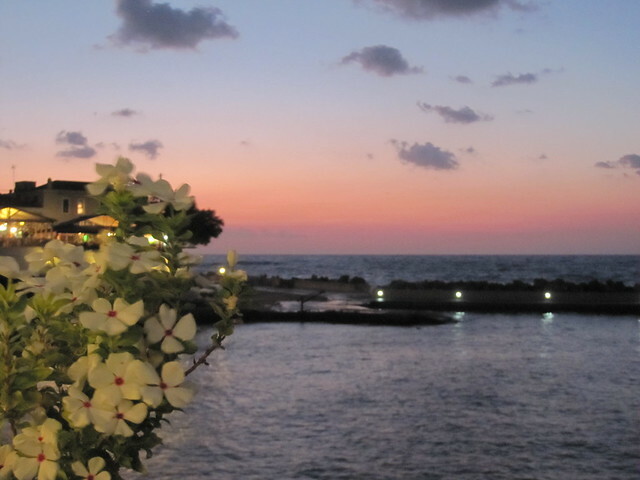 There is one main highway on the island of Crete that runs East – West on the north side of the island (where we were). 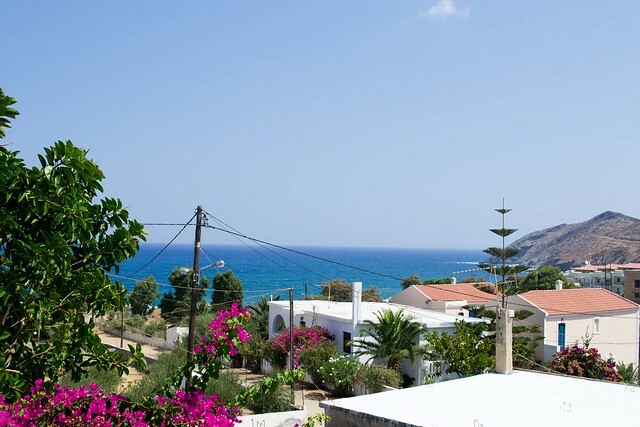 Crete is a very hilly island, so much of the highway are twists and turns around the mountains, often hugging the seashore, with massive cliffs dropping off into the sea. The highway was barely lit for most of it. There would be a light or two when we were approaching villages and towns, but for the most part nothing. The lanes did not have reflective squares on them. We could maybe see 20 meters in front of us, and virtually nothing if driving around the curves of the road. The Greeks drive amazingly fast around these twists and turns. It is a single lane highway, with many blind corners. I have no idea how the locals were able to weasel their way in and around traffic. Crazy! Crete – where a two lane highway becomes 4. More about this later! The whole time we were on the road, my heart was in my throat and I was utterly terrified. To make matters worse, the address we had for our first apartment wasn’t detailed enough. I had a vague idea of where we were going on the map and we had rented a GPS from the car rental company, not that it was much use. It was set for the town, but not the address of where we were going. The thing was in Greek, and the lady at the rental place didn’t speak English very well. Needless to say, our confidence of getting to the right place wasn’t very high. Not to mention, when you translate words between the Greek and Roman alphabet, there is a very big difference. The city the GPS was set to was nothing like it’s Roman counterpart. For example, the city we flew into could be written Heraklion or Irakion depending on who you talk to. When we got to where the GPS told us to go all we saw was a dead end and lots of water. If we had arrived hours earlier, we would have been greeted with views of this. We gave our host a call. There were some bars and restaurants open along the road and I went into one to ask for directions. There was a bartender, and three guys perched on bar stools. One of the guys came over, looked at where I wanted to go and grunted, “follow me.” So I scrambled back into the car and we followed this guy on a moped through the tiny, twisty streets of Panormo. About 5 minutes later, he pointed to a restaurant, turned around and sped into the darkness. We thought, maybe we were in the wrong town. We’re not looking for a restaurant, but apartments. I went to ask for directions, but when walking through the entry garden, I realized that the tables were set up in a semicircle and it looked like some sort of celebration. A wedding of sorts. Like a deer in headlights, I quickly backed out and headed back to a car. Moments later, a guy came running out and asked if he could help us. I showed him the address and asked if this was the right place and thankfully he said yes. Turns out it wasn’t a wedding that I had walked into, but an engagement party. By this time it was past midnight local time (Greece is an hour ahead of most of Europe) and the party was still going strong. Our host invited us into his restaurant for a welcome drink and snacks. He even gave us some of the cake from the engagement party with house-made ice cream (that was ridiculously delicious). We found this place on AirBnB – my first time using the service – and the service, aside from us getting lost, was certainly off to a great vacation. He showed us to our studio apartment and we settled in for some well deserved sleep. The next morning we woke up to the most amazing view. It definitely made the chaos of the night before so worth it. Tell me about a disorienting travel experience! What did you do? Wow, can I sympathize! I started off on the wrong foot in Greece as well. I arrived in the evening, it was pouring rain & the only map I had was on my almost-dead tablet. Trying to navigate streets whose names I couldn’t read after having not slept for 48 hours was a nightmare. But the next morning when the sun came up over the old city – wow! So gorgeous and worth it! Yikes! Sounds like the makings of a bad first impression. At least you were able to find you way and woke up to gorgeous Greece. talk about a beautiful spot! All’s well that ends well! It was definitely worth it. I had no idea how gorgeous it was when I arrived after sunset. Totally made it worth it. Wow, glad the rough night turned into a beautiful morning! We’ve had issues finding hotels before, too, and I’m wondering if we may have some problems next month getting to our hotel in Rome. But that’s part of the experience! Good luck on finding your hotel! I hate arriving into a new city at night. Almost always have bad first impressions. Thanks for the nomination Katrina! Wow, what a story! I’m glad you persevered and finally found the place you were looking for! Bad GPS, language barriers, poorly lit roads…it seemed like a recipe for disaster and I’m glad that it all worked out! That view is amazing btw! I really don’t know how we managed it. Both of us were pretty tired as well so we were really happy to have arrived in one piece to sleep! All is well that ends well, right? Looks beautiful! Definitely! It was so gorgeous. Waking up and opening the blinds was the most amazing / shocking thing. Oooof! That view is awesome. Some troubles definitely are worthwhile. Would love to see more photos. Wow! Brave, but glad you found the right place in the end. Mine is more embarrassing than anything, it was in Seville last summer. I had downloaded directions for my hostel from google maps and screen shot it so I could access it without WiFi, but I couldn’t find the road names. The heat, having come from Granada which had lovely cooling mountain breezes, was entirely oppressive (turns out it was 46c that day). I just could not get my bearings. I asked three people where I was going and all of them pointed me in different directions. In the end I started asking for squares near where I was going, according to my directions. Eventually, after nearly an hour I checked into my hostel. It was a ten minute walk from the bus station I arrived in- tops! Yikes! Arriving in a new city is always so jarring. The heat probably didn’t make things any easier. You just can’t think clearly! Glad you were able to make it okay eventually.